The first winner of the monthly competition to win a Bury Market Hamper came into collect her prize from Market Manager Andrew Heyes. Brenda Dagnall of Cheadle won the competition with her response to the question of what she liked about Bury Market. Brenda said, "Happy and friendly atmosphere, fabulous variety of goods and services and best prices all make it one of my favourite places to visit and shop." 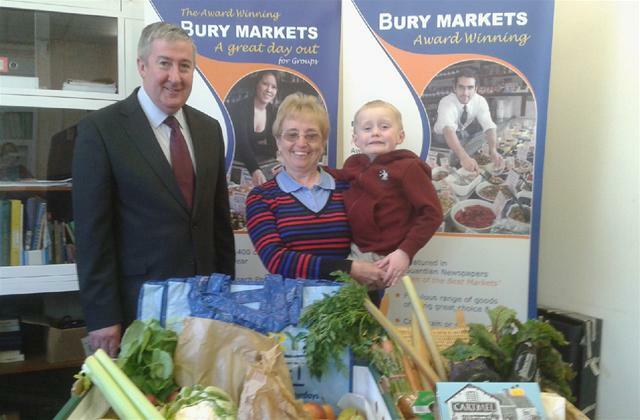 The picture shows Brenda and her grandson Callum who came into the Market Office to collect the Hamper, containing a selection of local produce, from Andrew Heyes the Market Manager.